This post is kindly sponsored by San Pelligrino. Click here to read more. Entertaining in the winter time can get a little boring. You can no longer go outside as much and are usually stuck to confined indoor spaces. That’s why I love the idea of a progressive dinner. You spend most of the party indoors but you get a change of scenery by going from house to house. Plus it feels like you are on an adventure together. I’ve been wanting to do this for a while so finally my friends and I got together for a progressive dinner around Paris. The prep for this party is easy because the host only has to make one course and clean up the house a bit. It’s much less overwhelming than throwing an entire dinner party. My friends live all over Paris so we just sprung for taxis to go from house to house but I also liked this idea of just choosing houses near each other in one neighborhood. My apartment is across from the Eiffel Tower so when it was all over we walked across the street to watch it sparkle on the hour. It was the perfect end to the night. Here are some tips for throwing your own progressive dinner. 1. Three houses feels about right. If they were close together I might try four. 4. Try to keep a little bit of a schedule. Have the table set and start the food right as you get to each new house because things always take longer than you think. 5. If you are using taxis try to call for vans ahead of time. Thanks to all my sweet friends for coming. Rubi, Stanton, Valerie, Allan, Caroline, Meg, and of course Paul. It was one of the funnest parties I’ve had in a long time. And besides a little coordinating it was actually pretty easy to put together. 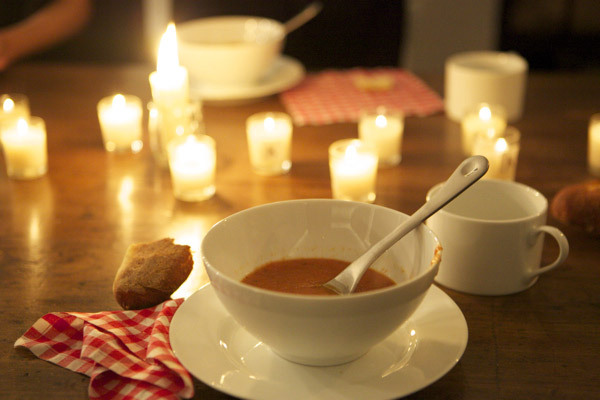 Have you ever done a progressive dinner? I’d love more tips if you have them. I had a birthday Progressive dinner just this Saturday gone! We live in Asia and everyone lives in a housing-estate/compound, so getting from house to house is easy! We kept it simple with bbq and easy to warm up starters and then dessert/drinks at the 3rd house. To spice things up everyone had to travel by wheels (bikes, scooter, skateboard) and we had hats and superman capes made for everyone with the birthday boys name. It must have been a sight to see everyone zooming around like superhero’s! Simple yet spectacular. Absolutely lovely. And the first picture is beyond fantastic. o. my gosh. how fantastic! My parents used to attend those when I was younger, but I haven’t been so lucky yet I’m sure your dinner walk trumps all though! 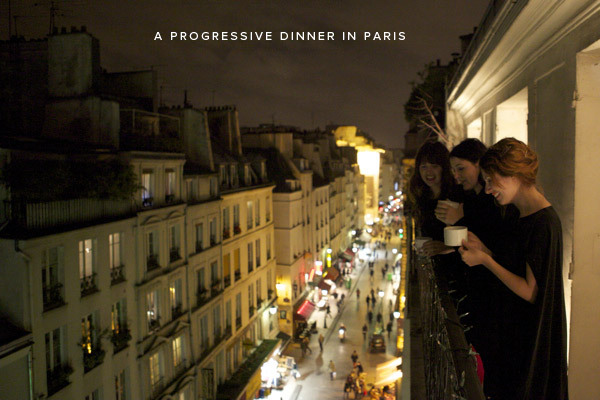 Who wouldn’t want to talk through Paris and eat progressively!? Oh my, oh my. this looks like so much fun. You are so clever Jordan. What a great idea! Did the kids stay up while you had people over at your house? How does that work? Our kids are little so they were asleep by the time we got back to our house. That balcony in the first photo is so lovely! And of course, so are there rest of the photos! It looks so fun – thinking hard now what could be our “Eiffel Tower” here in Dublin…the Spire? Not quite as beautifully lit! Trying to do that in Southern Europe is a differente matter!! Love the idea! And how lucky are your friends to have that view of Rue Montorgueil? This was so fun! The pictures turned out wonderfully. It really was a lovely evening. 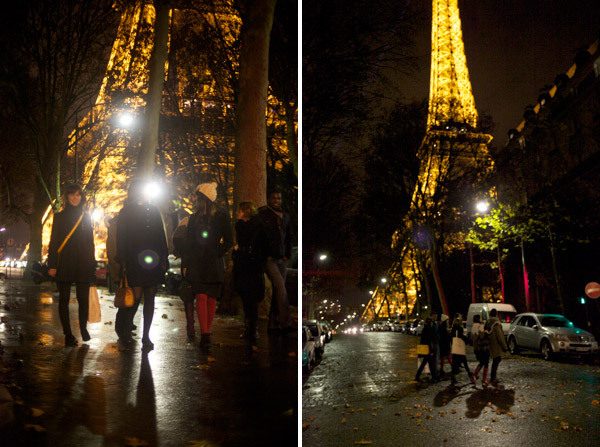 The stroll by the Eiffel Tower is the cherry on top! p.s. I’m diggin’ all the polka dots! Ha! Paris can be dreamy but also frustrating. Remember I just mention the happy stuff here. I love progressive dinners, they are so much fun! Gives me an idea for my next birthday, don’t know never thought of that to begin with. Sounds like fun! Now I just wish I lived somewhere where my friends were in walking distance! A couple of Christmases ago, my friend and I threw a progressive holiday karaoke party. We started at her house for dinner, then hopped in vans headed for a Korean private karaoke lounge where we sang our hearts out, and ended up at my house for dessert. I agree, progressive dinner parties are the best! 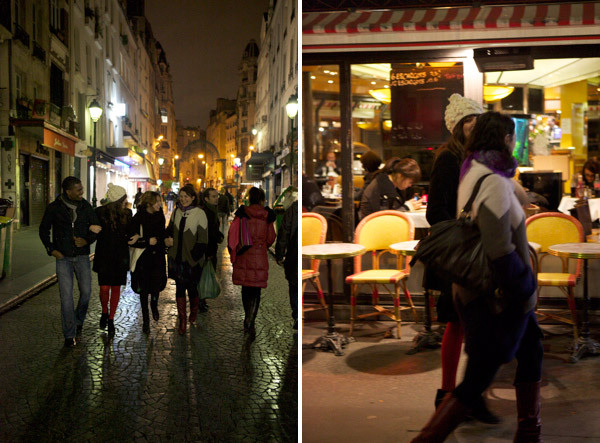 Your Paris party looks absolutely dreamy. How fun! And to be in Paris… wow! I have never tried this, but would love to give it a try! We are doing that this weekend! I’m sure our dinner won’t be as posh as yours… no Eiffel Tower in Stratford Ont! We all live down the street from one another it will be very easy move from house to house. i’ve been to a progressive dinner once, but never hosted one. they are such fun! yours looks delightful. and ps, i could hardly contain my excitement/jealousy to hear that you live across from the eiffel tower. if you ever want to visit downtown toronto, i’d be glad to swap apartments you may not get yours back, though. My friend had a Progressive Thanksgiving dinner this year! It took the load off of one person preparing the entire meal and her whole family participated! Such a fun idea. really like the simplicity of the table decor, just a few candles and it’s so perfect! a progressive dinner sounds fun. now i just need to find a few close friends to plan this around! haha. Hi Jordan – great post! I love progressive dinners. When I was in high school my neighborhood hosted one each New Year’s Eve. I think there were about 5-6 families (including little kids) that participated and the evening was spread out among 4 houses. Each house hosted either appetizers/salad, main course, dessert, or Champaign/sparkling cider for the midnight toast. I remember thinking that it was so exciting! I especially loved that we gathered people from all ages together to celebrate. oh my how divine would that be- great pictures. 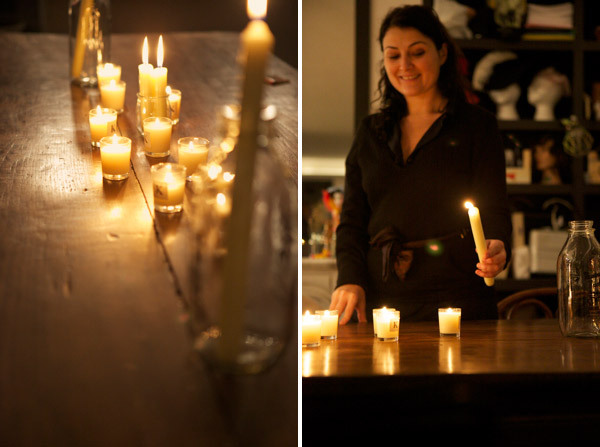 my favorite is the sideways taper candle in the mason jar…..such a cute idea. okay so all i need to figure out now is how to get the eiffel tower to vancouver, because SERIOUSLY it just makes the night that. much. better!!!!! you are so blessed to live in paris! it is a big dream of mine! We did one when I worked at an international school in Germany. It was a great way for all the teachers & staff (new and old) to work on something together, and to get to know each other. We did fondues at each of the 3 homes – savory to begin with and sweet to end. Really fun! We just had a progressive party with neighborhood friends from our son’s preschool and it was so much fun. We had the kids with us at the first house while we had cocktails and hors d’oeuvres and then dropped them off with their favorite teachers/sitters at the next location, then went onto dinner at a third location and then back to the kids (who were all asleep at that point) for dessert and an impromptu dance party. Such a fun night. Of course we did not have a view of the Eiffel Tower on our walk which would have made it 100 times better. Wonderful photos. Wonderful idea. And by the looks of it…pretty wonderful looking food. I’ll be putting this idea on my bucket list. Once I actually get around to writing one. what a lovely time!! I really enjoyed the photos! Love this! We used to do them in college. I need to revive the tradition! We did a progressive party one New Years Eve here in tiny Telluride, Colorado. Appetizers started at my condo, then we moved to a house for the main course, then another condo for dessert, and then we all went down to our Main Street Courthouse (a Telluride tradition – the entire town shows up) for the midnight countdown. Luckily Telluride is so small that we could just walk from location to location and having the midnight countdown gave us something to build up towards throughout the evening. It was such a great way to ring in the New Year. I mean, it is no stroll by the Eiffel Tower, but a cozy winter ski-town holiday type of fun nonetheless. We did a progressive dinner awhile back – and we all live very close to one another, so it was easy to get around…. our problem was that the ‘appetizer’ host made a very boozy cocktail – and by the time we hit dinner most of the dinner party had a bit too much. Made it a bit wilder than we intended – but it also made it hilariously fun. Magical! I love the idea of doing a progressive Thanksgiving dinner. You could also do a progressive Christmas dinner with small gifts at each house for the other guests. wow … I really love this idea! While living in the Crocus Hill area of Saint Paul, Minnesota there was a large progressive dinner–starting with cocktails and ending with dessert–the women who organized it were amazing. It was a great way to get together with neighbors and meet new people. As I recall you would tell the organizers how many people and which meal you would do. Great fun community event, but there is a lot to be said about having a small group. Walking neighborhoods helped. That looks so incredibly wonderful. So chic and elegant and fun! 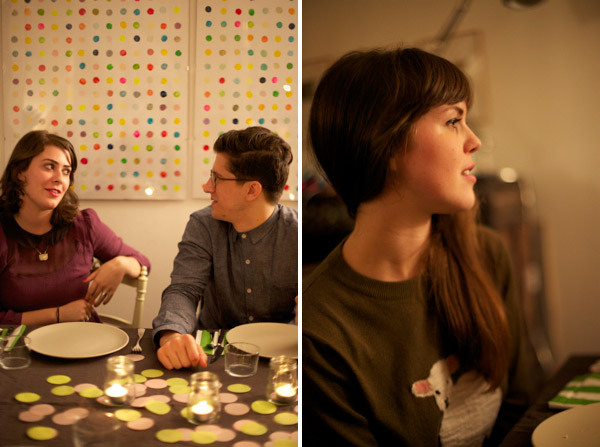 Love your DIY dot paintings in the background. I’m still hoping to give those a try! I LOVE that coffee mug, tell me I can get it in the US?!?! I’ve never seen a progressive dinner like this one! Wow, so beautiful. Looks like such great fun. I am in the process of planning my own progressive dinner soon. We did an “Around the World Bicycle Party” for 3 years in a row. We had 4-5 houses and each house was a country- the hosts made appetizers, and served beverages reminiscent of that country. We traveled around to each other’s homes on bicycle (we lived within in a mile or 2 of each other). It was such a hit that even after most of us moved on to other places, we’ve heard that people who attended have carried on the tradition. It was so much fun. C-O-L-O-R- + -L-I-G-H-T « De quelle planète es-tu?